Whether you are a small business owner looking to back-up company files, an art teacher who wants to pass on interesting curios to your class, or an audiophile who is transferring your LP records and want a copy that will last for many years. Despite advances in CD and DVD-R technology, data breaks down and degrades occur over time. The dye on a disc which stores the data can corrode causing data errors during playback or reading the disc. The reflective layer can also oxidize and prematurely cause data degradation and loss of quality or even complete loss of data. 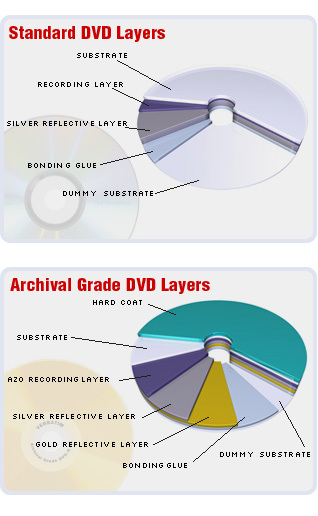 Many recordable DVD and CD discs use silver as a reflective surface. Special “archive grade” CD-R and DVD-R however, use a more resistant 24 carat gold reflective layer. MAM-A boasts that their gold CD-R can last 300 years and Gold DVD-R 100 years. • You want to keep important tax information or business accounting records on hand for years to protect your business. • You live in a climate that has a lot of humidity and other climate factors that might cause non-archival grade discs to degrade relatively rapidly. • You’ve discovered from experience that standard recording technologies are not long term enough for your data protection. • You need to create a “master” audio CD that will archive music recordings that can’t be replaced if lost. • You want to keep copies of camcorders movies for generations. In the professional CD and DVD duplication industry one of the downsides of inkjet printing was the fact that it smudged if touched during the dry time, also it would smeared if it came in contact with a liquid even after it was dry. In 2008, we have seen the introduction of waterproof inkjet media surfaces by Taiyo Yuden, Verbatim and Imation. Waterproof inkjet media allows consumers and professionals alike to label CDs and DVDs with the ease and flexibility of using an inkjet printer combined with the advantages of a permanent waterproof surface. When you print on a waterproof inkjet CD-R or DVD-R, you not only get a glossy finished look (which provides better color contrast), but you also get more protection against moisture, smudging and damage from the elements. • You’re archiving data for your company and storing it in a basement that has a history of flooding. • You’re burning a bunch of audio CDs to take on a wilderness trip, during which you might be exposed to harsh elemental conditions. • You’re compiling a presentation for a “give away” at a sales conference, and you anticipate that the people who will be receiving your demos will treat them roughly, so you want to prevent your labeling from rubbing off. (if your contact information rubs off the disc, an interested buyer might not be able to find you). The Taiyo Yuden Company makes waterproof inkjet printable DVD-R and CD-R named Watershield. Taiyo Yuden Watershield DVD-R is offered in a 16x record speed and the CD-R is a 52x. Both CD-R and DVD-R Watershield discs are hub printable allowing inkjet printing on a larger part of the disc surface (closer to the center hole of the disc). These discs are great for color inkjet printers. The Watershield coating dries rapidly and resists both water and smudging. Another waterproof inkjet product is the AquaAce Water Resistant DVD-R manufactured by Verbatim. This disc will provide exceptional color contrast, edge to edge printing, compatibility with a wide variety of printers, a lifetime warranty, and very rapid dry times. Dual layer DVD, DVD+R DL technology is changing the way businesses, consumers, and home users can archive and store their data. Dual layer DVD (DVD+R9) technology first debuted in October 2003 and got released to the popular markets about a year later. What makes dual layer DVD recording different? Essentially, with single layer discs, you’re limited to storing data on just one layer. With dual layered discs, on the other hand, you can store information on both a first layer (which is semi transparent) AND an underlying second layer. In other words, you almost double the capacity of the DVD+R. The industry standard single layer DVD+R, for instance, holds 4.7 GB; whereas a dual layer disc has a capacity of 8.55 GB. Most popular DVD recorders and players are compatible with dual layer DVD technology. However, if your computer or optical disc drive is relatively old (2004), you may have some compatibility issues. Check equipment manuals for DVD+R DL compatibility before you purchase dual layer DVD discs. A little confusion from time-to-time causes customers to ask “which version do I chose +R (plus) or –R (minus)?” With dual layer DVD the +R (plus) format is the more popular version, whereas with single layer DVD, the –R (minus) format is the more popular version. As for the brands, Verbatim tends to be the most popular for DVD+R DL (Dual Layer) and both Taiyo Yuden and Verbatim brands are the most popular for DVD-R (single layer). Given that the dual layer recording layers are not continuous (obviously), there can be a very slight delay when you transition from the first layer to the second layer. This pause is completely normal and does not mean that the disc is not working. The laser that reads and writes the data will actually focus on the different layers and that is what causes the delay. Most packaging will explain this upfront. All JVC optical media products will now be manufactured by Taiyo Yuden and retain the JVC Media brand name. Taiyo Yuden acquired the branding and licensing rights to the JVC media name. Any new products released will be branded JVC. All current products will transition to the JVC brand in about 3-6 months but we have no firm time line. Blu-ray, also known as Blu-ray Disc (BD) is the next generation optical disc format developed to enable recording, rewriting and playback of high-definition video (HD), as well as storing large amounts of data. The applications for Blu-ray span the entire storage spectrum–Data, Audio, Photo and Video storage for personal and professional use. With the availability of LTH Type hardware and firmware from industry leaders such as Sony and Panasonic, the momentum is already building for media that will enable consumers to move up to the more affordable BD media. Verbatim 25GB BD-R LTH Type discs feature a new technically advanced organic dye in the recording layer that can be burned at speeds of 1x and 2x. By switching from the more expensive inorganic layer used with current BD-R to the new organic layer, manufacturing costs can be reduced. Leveraging its many years of success in developing organic AZO recording layers for CD-R and DVD-R media, MKM developed a new organic AZO recording layer for the BD-R LTH Type media and produced sample discs for testing. The patented AZO dye used in the recording layer of Verbatim BD-R LTH Type media provides a unique combination of features that range from increased sensitivity to laser light — the key requirement for optimized recording performance, to control the heat interference between consecutive recorded marks for substantially less jitter and reduced degradation of recording marks. The innovative dye also features a wide power margin to ensure quality recording on the entire disc surface. Unlike current BD-R discs, in which the inorganic recording layer is made by the sputtering process, the organic recording layer for BD-R LTH TYPE media can be applied using the same dye spin coating process as CD-R or DVD-R media. As a result, Verbatim will be able to begin mass production of its BD-R LTH TYPE by only slightly modifying existing CD-R or DVD-R production lines and by adding the cover layer coating process with super hard coat feature. BD-R LTH Type discs offer a more affordable solution to high-definition video storage. In comparison to standard BD-R discs which use inorganic dye, BD-R LTH discs use an organic AZO layer which MKM developed leveraging its many years of success in developing organic AZO recording layers for CD-R and DVD-R media. BD-R LTH Type media is applied using the same dye spin coating process as CD-R or DVD-R media. Recorded data lies close to the surface of BD discs. Therefore all Verbatim BD media features a proprietary Hard Coat finish. This layer provides added protection from scratches, dust particles and fingerprints that can damage data and cause recording and playback errors. Verbatim BD-R LTH, 96569 expected Summer 2009.